I've been posting reviews of everything I've read this year on Instagram with #soobsessedwithbooks, and I recently got a great question on one of my posts from a fellow mom asking how I find time to read now that I have a baby. When I responded, I realized it would make a great a topic for a post. There are five tips that immediately came to mind, and I'll chat more about those below. But I wanted to preface with something first. My son is eighteen months old, and he's my only child right now. Finding time to read as the mom of one is different than finding time to read as the mom of four, for example. I recognize that! And, as I mentioned to the commenter, I've read a lot more this year than I did last year because my son's age and stage of development has made it easier than it was before. I say both of those things to acknowledge that everyone has different circumstances -- and that my reading life could change again at any moment. 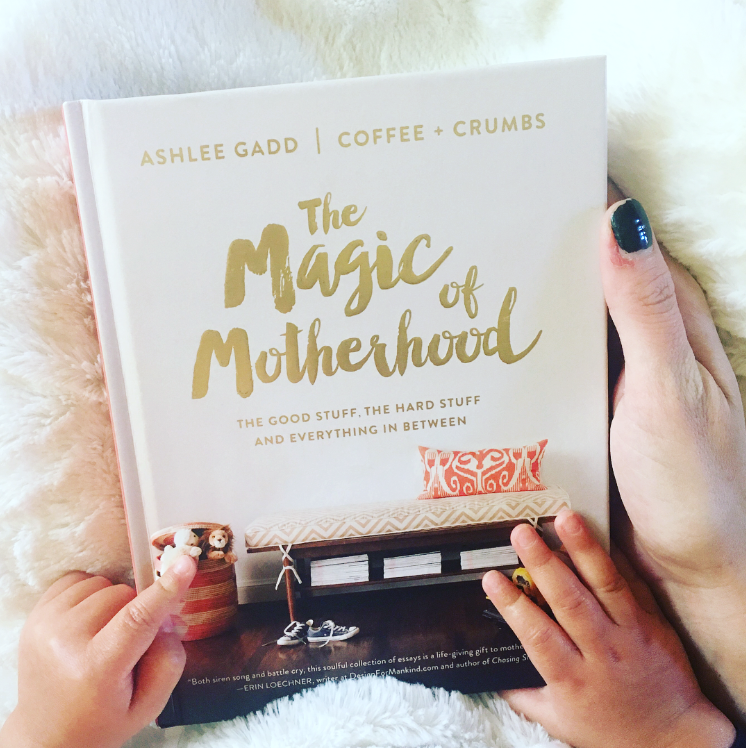 When I was pregnant, I frequently heard the same refrain from parents: "Oh, you love to read? Just wait until the baby arrives...." or "You won't have the time/energy/desire to read with a baby..." or "Reading once you have kids? Hahaha!" And honestly, it made me so mad. It's rude, discouraging and condescending. Just thinking about it now makes my blood boil. You know what a new parent doesn't need to hear? Someone else telling them that having a baby equals no longer doing the things that they enjoy. Last year, I wrote a post called Six in Sixteen: What I've Learned This Year. And I mentioned that I'd learned to "find the time." Whenever I've told my mom that I wish I did ______ more or had more time for _____, she responds by saying that if I wanted to do it, I would. It sounds harsh or simplistic, but her point was that we make time for the things that are truly important to us. She wouldn't say it to make me feel guilty or to be judgmental; it was just stating the obvious. If I cared about it, I'd find the time for it. You'll have less free time with a baby, but you will have some. And you get to decide what you want to do with it. The people who told me they never had time to read after having a baby? What they usually meant was: "That's not how I chose to spend my time." And that's okay! Not everyone will prioritize reading. It's so easy to spend an entire evening watching YouTube videos on my phone, bingeing something on Netflix, looking at Pinterest, working on a blog post, etcetera... and sometimes I do those things. But I can't complain that I don't have time to read! I do -- it's just that I didn't choose to use my time on it. Everyone is busy in their own way -- and that doesn't just apply to parents. Choosing to do one thing always means you're choosing not to do everything else available to you. The only thing I took away from my college economics class was the concept of opportunity cost, but I'll never forget it. For me, choosing to read often "costs" me the opportunity to blog. I'd love to blog more consistently, but I know that doing so would take away time from reading. And most of the time, I'd honestly rather read! But that's why my first piece of advice is to just make a decision that you want to prioritize reading. The practical, actionable ways that's lived out will look different from everyone. It could be a long-term goal of finishing one book per month or a short-term goal of reading for fifteen minutes each day -- the details don't matter as much as the actual decision to do it. It sounds so basic (and kinda dumb) to make this a tip, but I feel like it's the foundation. You have to decide first, and then you'll find a way to make it happen. This is a two-part piece of advice. I'll start with early to bed! I'm a huge fan of early bedtimes (and sleep training and sleep schedules and all that debatable nonsense). Once my son was past the newborn stage of needing to eat around the clock, we established bedtime at 7 p.m. It occasionally fluctuates based on that day's nap(s) or evening plans, but we're generally pretty consistent. And honestly, that early bedtime is a lifesaver. I can get so much done in the evenings because I basically never go to bed before 10 p.m. Most nights, I'm awake until close to midnight. That's between 3-5 hours of free time. And yes, sometimes that involves various chores or tasks that I have to get done, but still. Those are golden hours! Early bedtimes for kids won't always be feasible, but I highly recommend aiming for it. So much of my reading happens after my son goes to bed. And then there's the second part of that phrase - early to rise. Unlike the first part of the phrase, this part of my advice involves your sleeping habits. If you can't already tell, I'm not a morning person. At all. But I wish that I was because the morning can be a wonderful time to work in extra reading. If you can get up before the rest of the household, you've got uninterrupted time right there. 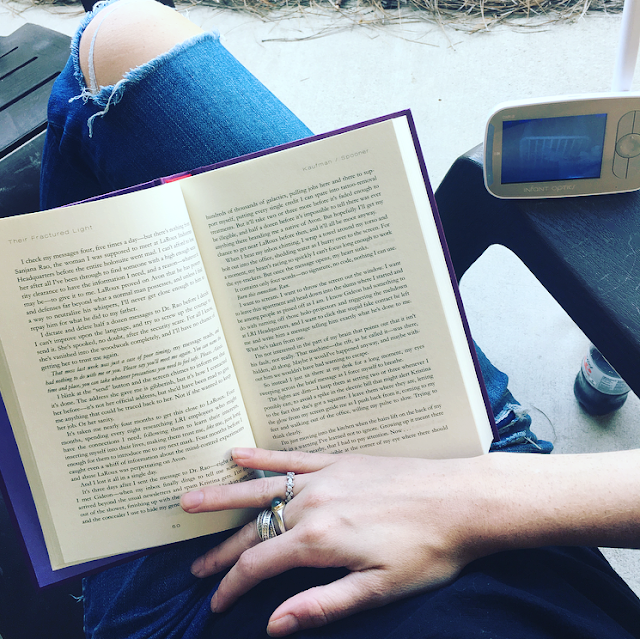 Rikki from The Ardent Biblio recently posted about being a morning reader, and I absolutely loved what she shared. While I don't see my night owl ways changing anytime soon, I do think this is a wonderful suggestion for so many people. The mornings can often feel a little frantic, especially if you've got to get out the door for work/school/etc., but how lovely to work towards a peaceful and rewarding start to the day. Of all the tips on my list, this one has the biggest gamechanger for me. I listened to audiobooks before I had a baby, but it was pretty sporadic. It was hard for me to listen at work because my job often required too much mental focus, and I often defaulted to music while driving in the car. But ever since my son was born, I've developed a deep love and appreciation for audiobooks (and podcasts, too). At the time I'm writing this post, almost 30% of what I've read this year have been audiobooks. That's a big deal! Here's the biggest reason I love them: I can listen while driving, while doing chores around the house (laundry, cleaning, and cooking), while getting ready for the day, while grocery shopping or running errands, while walking around my neighborhood and while laying in my bed at night. In my opinion, it's the most versatile format! If I take my son to the grocery store, I'm going to talk to him and narrate our trip instead of listening to an audiobook. But if I go by myself? Hello, headphones! The same goes for all the other things I listed. I don't necessarily listen to an audiobook every day, but having the ability to get stuff done and read a book is incredible. Being able to multitask is way more important to me now than it was before I had my son. I have an Audible membership, so that's one audiobook per month. Plus, I have library cards for two counties (one I live in and one I pay to access) which gives me access to Overdrive through one and Hoopla through the other. Both have extensive audiobook selections! I started with re-reads and have since branched into new-to-me books now that my brain has finally trained itself to pay attention. I'm so glad this format exists! People have always asked me how I have time to read as much as I do (even before I had a baby). Some of it goes back to the first thing I shared - I want to spend time reading, so I do. But many of the people asking didn't love to read, so they couldn't necessarily envision all the unexpected opportunities to squeeze in a little extra reading. Looking for the little moments is one of the keys to my reading life! Sometimes I approach reading as something that needs to be done for an extended amount of time for it to count. I don't do this on purpose -- it's just my mental default that I have to tune out. Because honestly? Sometimes managing to find 15 minutes to read is the best I can do, and that's okay. But it also means that I need to be aware of those small windows of opportunity so that I don't miss them. Those windows often come from reading on my phone while waiting for something else to happen, like sitting in a doctor's office. For the first year of my son's life, the biggest and most obvious window was while I was nursing. I spent so much time looking at Twitter and Instagram before I thought, I ought to be reading right now! And now that he's no longer nursing and is beginning to play a little more independently, sometimes that window is while I'm sitting on the couch watching him build a tower out of blocks. Reading this way can sometimes make a book feel disjointed, and some are definitely more suited to being read in small increments than others. But I've learned to accept it because it's a huge reason I've been able to read as much as I do! And honestly? You could only read a page per day, and you'd still be a reader. My husband reads one chapter of a book before bed (and less than that if he's tired) -- he's a reader. And my final piece of advice? Remember this is a season of your life and won't last forever. If you just don't have the energy or desire to read, don't beat yourself up for putting books on the backburner. I've had long stretches where I just didn't pick up a book. Sometimes I just want to watch TV, work on a blog post, paint my nails, decorate my planner or do any of the other random things that bring me joy. Including sleep. I always remind myself that I'm reading for pleasure and it's not worth it if I'm forcing myself to do it. Reading slumps where you want to read something and just can't find the right book for your mood are frustrating. But some slumps leave me wanting to do anything but read, and I don't fight those feelings. Books will wait for me -- no matter how long it takes. Reading isn't a competition. There's no finish line to cross, award to accept or benchmark to reach. It's something you do for the joy of it. And I know how frustrating it can be when life makes it difficult to find the time do the things you love! That's why I remind myself that I can choose my attitude and perspective in this season. I won't always get it right (because some days are truly exhausting), but I can do my best. How do you find time to read when you're busy? I love this post! I just had my baby in April and I am frankly annoyed consistently by people who say I will never have time to read. I do have the time -- and do a lot of the things you mentioned here. Like, audiobooks, those are the absolute best, I listen to them on my commute to work and when I am traveling. I also get up early to read. Then there's my lunch break at work. It really is a matter of priorities. I am trying to scroll social media less and read more. I also am prioritizing reading books over writing the reviews which would explain why I am so behind in blogging. Anyways, this post is A+ and as a new mom who is STILL reading, I agree 100% with it. APRIL! I was excited when I saw your name pop up in my email because I know that a comment from you will always be a thoughtful one :) Aren't the "you'll never have time to read with a baby" people just the most annoying?! I haaaated it when I was pregnant, and now I wanna be like LOOK AT ME MAKING TIME TO READ! Hannah, I LOVE this post! I don’t think # 1 is basic or dumb at all — it is pretty much the key to it all! I still make time to read — mainly because it is my #1 stress-reliever and the most effective and enjoyable way I know to relax after a tense or difficult day — or even just a difficult morning and then I’m diving into a book at nap-time! 2. I'm glad you agree that the first point is the key to it all! That's how I feel, too. If you decide that reading is a priority, you'll find a way to make it happen. It may not be as often or as much as you'd ideally like, but it will be something. 3. He's sleeping from 7pm-7am. But it definitely took sleep training to get there + he was waking in the night for a long time. He still has off nights - the time change and teething have made the past week a little rocky - but he's pretty consistent overall. 4:45 wakeup sounds miserable -- girl, I feel for you! 4. That's how I feel about reading, too! I enjoy watching TV, but reading is definitely my favorite way to relax and decompress. I love being able to sit down with a book during nap time! I try to get stuff done around the house during naps but sometimes I'm just like NOPE GIMME MY BOOK. 5. Yeah, a physical book is definitely easier when my son is playing! If my son is awake & I'm listening to an audio, it's typically when I'm taking him on a walk in the neighborhood. I go through phases with audiobooks -- I've listened four already in November, but I didn't listen to any in September. So many factors affect my audio habits! 6. Yeah, there are definitely some non-negotiable priorities but just mindlessly browsing my phone/computer is a huge way I waste my free time. I don't mean to, but it's so easy (especially if I finished a book & haven't picked a new one yet -- because if I've started something, I'm so much more likely to want ton pick it up rather than look at the Internet). This post is so perfect! My situation is because I'm essentially working two jobs until candles go full-time so I literally have maybe a half hour of downtime a day if I'm lucky. I read on my lunch break at my full-time job and that's about the only time I have to read books. Audiobooks have been a LIFESAVER. Thankfully I've been listening to them for years and have fallen head-over-heels because I know they don't work for everyone, but they're so amazing while I'm driving (which is an hour each way, if my husband and I don't carpool, although we often do) and I can listen for hours on end while making candles because candlemaking doesn't involve TOO many thoughts that need me to read words (that's when I get unfocused while listening). Over 75% of my reads this year have been audiobooks. I would have only read about 20 books this year without them, versus 90 books right now (and I still have a month to go)! I do try to make time on the weekends to read for a little bit while my husband sleeps in and I'll intentionally get up early on a weekend day so I can read a little bit. It's so rewarding to get up even just a half hour early and read with my coffee and have that time of relaxing and doing something that I love! It can get stressful trying to read at work with so many people talking so I like setting aside that time where it's quiet and peaceful! Great post!! I always heard "you'll never have time for x y and z" and I wholeheartedly have always ageeed with your mom. I remember a dude I worked with acting like he "didn't have time to read" but I'm like I bet if we break down our days we will see time slots you technically could have chosen to read and you did something else. I am with you on that. Having children initially can sound so daunting already, why does everyone try to hard to tell you you won't sleep, eat or have access to any of your hobbies if you do? Why would I want a child, if everyone keeps telling me it will make my life absolutely miserable, right? People should stop doing that. It's so negative. I'm glad you learned to find the time. I am also a believer in "find the time". Although sometimes it probably takes more determination and sheer will power. Hmm, I can't see myself as a morning reader though. I've tried, and I just sort of... can't stay awake. It doesn't work :D maybe everyone's different. Reading in the evening is much easier for me somehow. Making the time for reading is my number one tip when it comes to finding the time to read - be it as a parent or not. I personally know I don't read an amazing amount of books a year, but I know that I do make the time to sit down with a book, usually at least once a day, and soak up the written word and enjoy one of my favourite pastimes. The other tips shared here are all super helpful too - I'm with you on that 7pm bedtime... Our son has just turned 4 and it's still going strong! Thank you for this post :) I don't have kids, but I found each of these tips really useful; particularly as I'm starting to fret about picking up my studies again and I was worried about how to fit in reading. I tend to forget you can just read or listen a bit at a time!